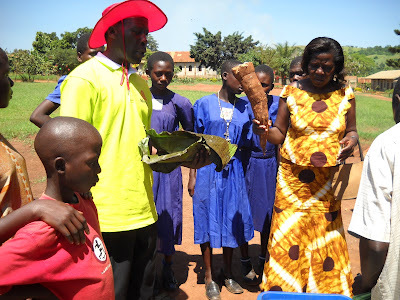 Developing Innovations in School and Community Cultivation (Project DISCC): Project DISC and Slow Food Mukono Convivium Celebrate Terra Madre day 13th Dec 2009. 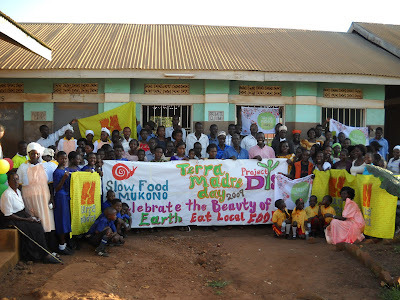 Project DISC and Slow Food Mukono Convivium Celebrate Terra Madre day 13th Dec 2009. Thanks to Slow food president Carlo Petrin and all the Slow food members around the Earth for letting this happen. Among the Local food eaten in include in their local names:- Baluggu, ensujju (pumpkin), eniina (Small African wild Tomatoes), ensusuti, kivuuvu, kaama (Wild Yams), ekkobe, omubisi (Banana Juice), nakkati (African eggplnts), enswa (White Flying ants), amayuni (Wet land Yams), a matooke (Bananas), ebbuga (Red Amaranth), katunkuma (Bitter egg plants), entutunu and others. We are very happy to celebrate this day. Farmers after this celebration promised to save The Beauty of the earth by saving our local food and eating it. It's really fantastic to read about what you are doing with the school gardens. It sounds like a really amazing project and you are clearly putting in a lot of hard work. I'm the new leader of Slow Food Solent, a local SF group in the UK. I'm also a researcher studying sleeping sickness in Uganda, so travel frequently to Uganda - hence my interest in your school gardens project. I'm hoping that at some point in the future I might be able to come and meet you and see one of the school gardens!! Our email address is slowfoodsolent[at]hotmail.co.uk if you want to get in touch, or you can see our website at http://sites.google.com/site/slowfoodsolent/ if you are interested. The participation of students in food production does not only enhance their taste behaviours and nutrition status, but can possibly lead to social transformation. Social conditions are complex and therefore positive attitude towards cultivation should be built within children that will in turn help to reverse the existing food shortages. 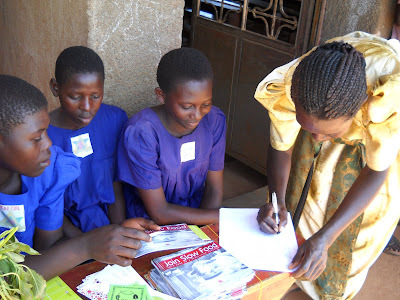 The fact is that Project DISC aims at engaging School Children and the local youth communities in real life production of Clean, Safe and Fair food through working with schools and communities.